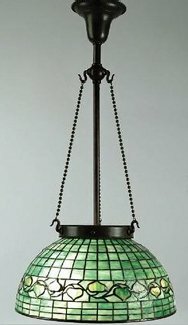 Hanging green glass background "Trailing Leaf" chandelier. It is classified with the "geometric" pattern shades, despite the small design, versus a "floral" design. Green mottled glass.